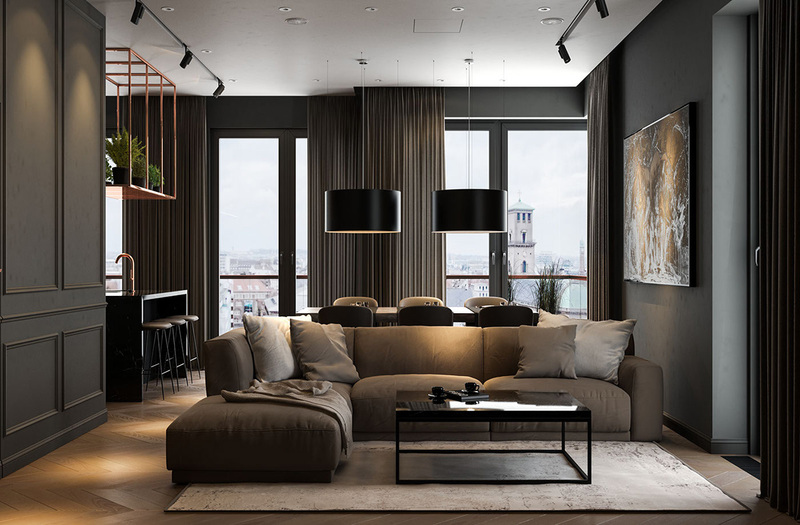 The first modern dark interior on our list is a sophisticated taupe, black and grey affair with shining copper accents to contrast. 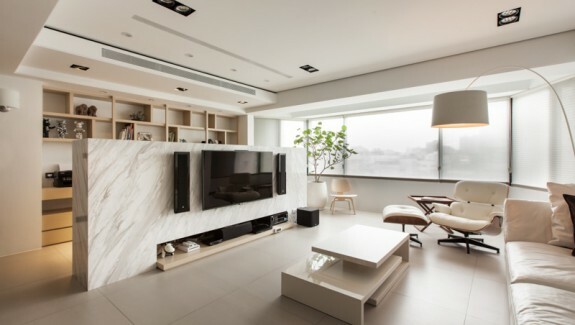 The living area is entirely open plan in an L-shaped formation. 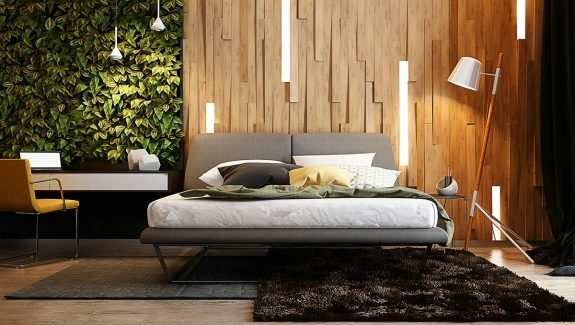 The taupe sofa faces a feature wall with a black extruded tile design. 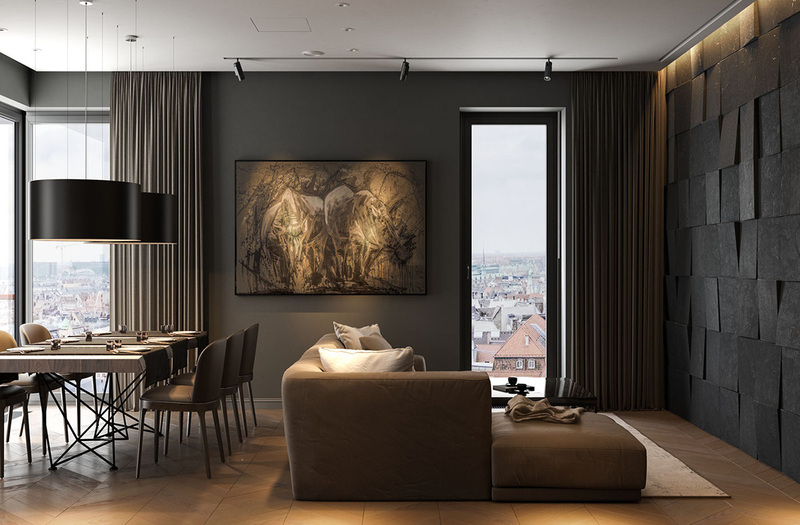 Large wall art in the living room is dramatically lit from above by focused track lighting. 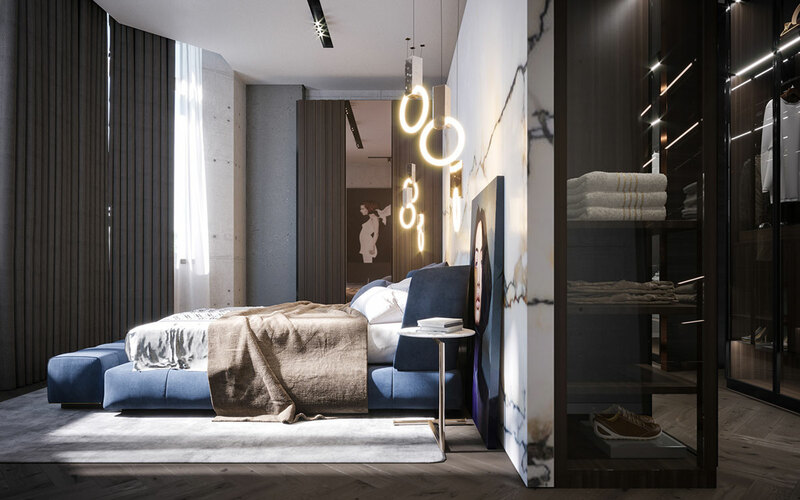 When the drapes are drawn, each piece of lighting illuminates only its specifically designated area, letting shadow fall in the space between. 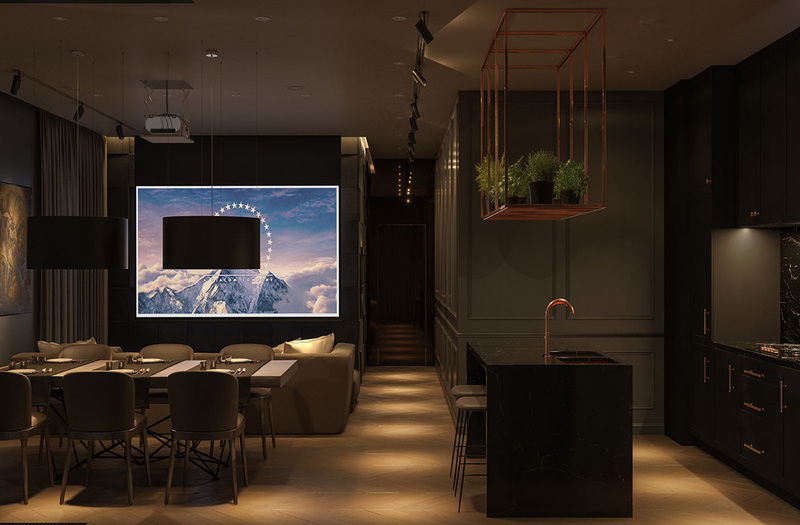 A focussed lighting design scheme makes this apartment the ideal setting in which to view a home cinema screen. 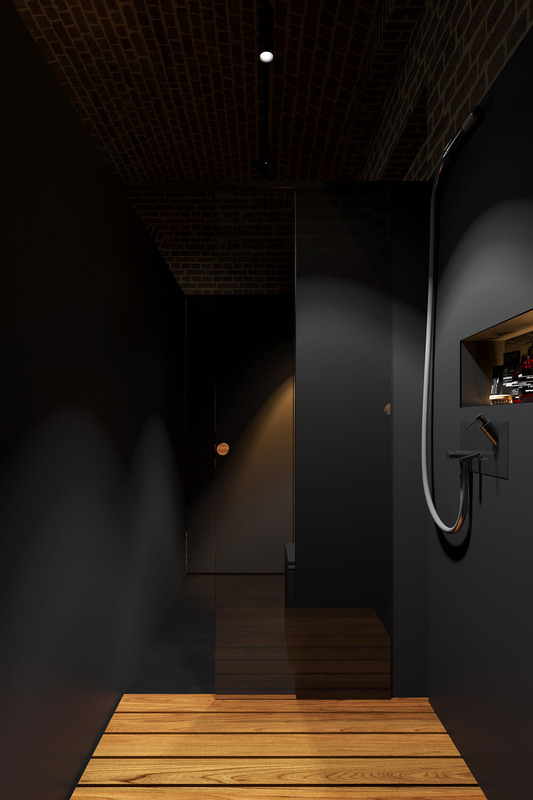 The projection screen descends from a recessed slot in the ceiling as if by magic. The projection unit itself lowers into place from a concealed position within the roof, descending on a ceiling panel platform, affixed to a concertina bracket. 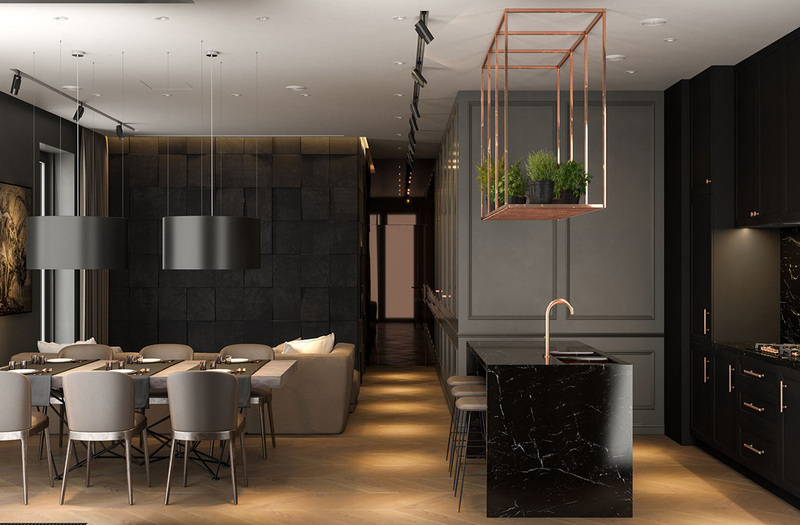 Behind the sofa, a sophisticated dining area leads onto a black marble topped kitchen. 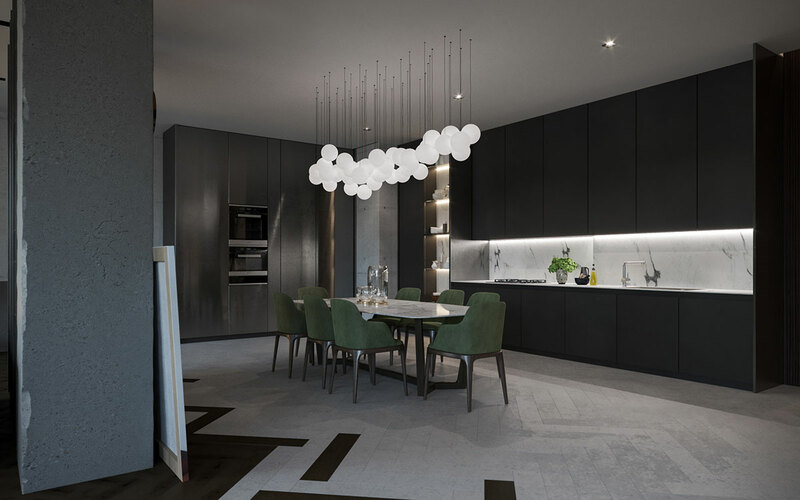 The flooring through the home is kept light to lift the dark coloured scheme. 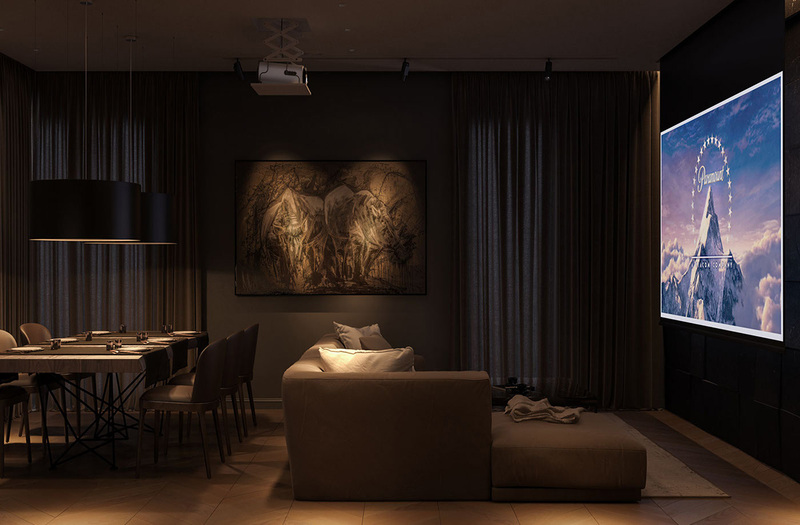 The home cinema screen can be enjoyed from the dining table also, to take in a movie with dinner. 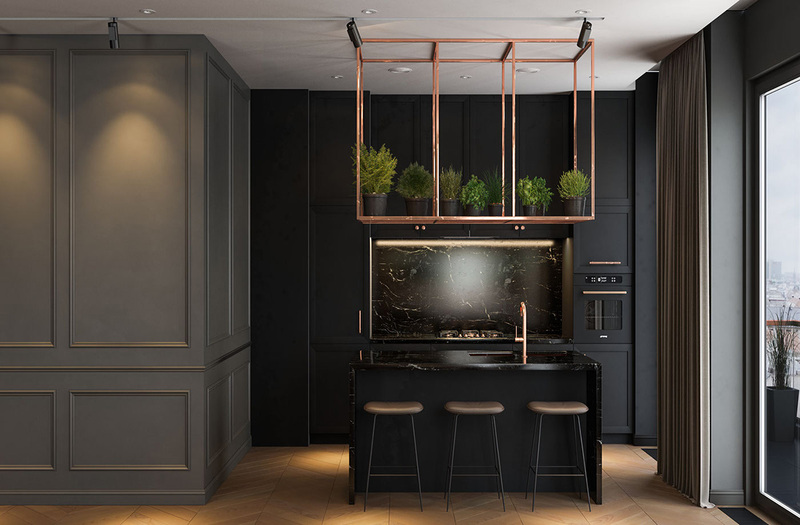 Copper accents brighten the kitchen, in the shape of shining handles, a gleaming faucet and an overhead rack to hold a collection of indoor herb planters. 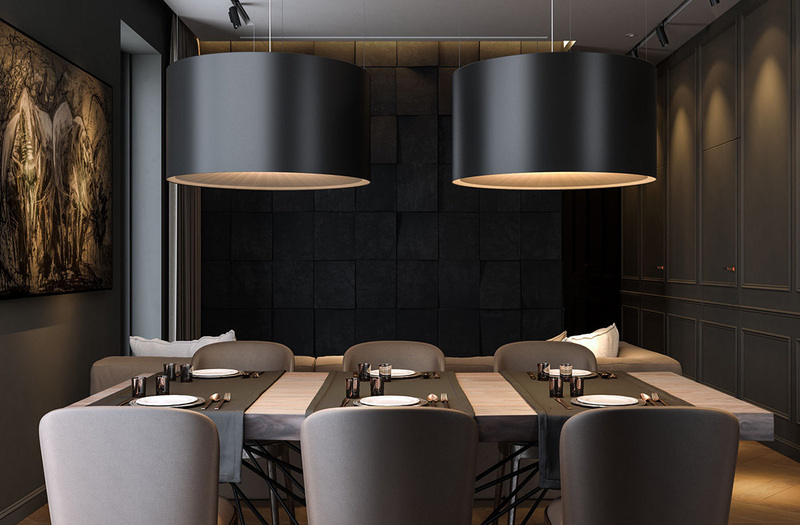 Two large pendant light shades span the entire length of the dining room table. The tabletop is dressed with three short table runners in black. The flatware is a white design to lighten the table ensemble. 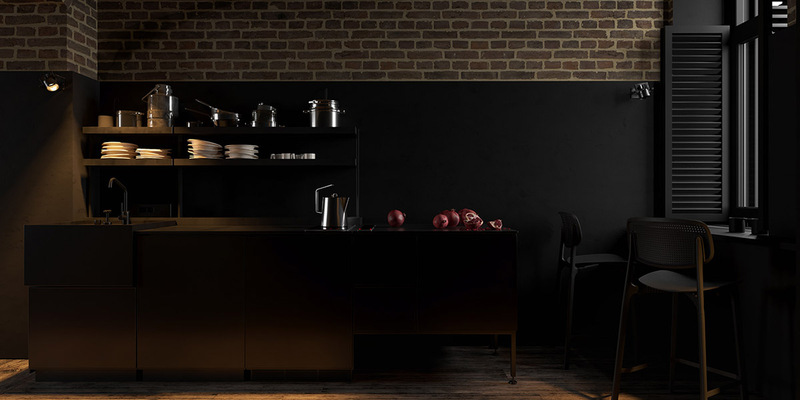 Grey painted wainscoting lines one wall, providing subtle contrast against the black kitchen cabinets. 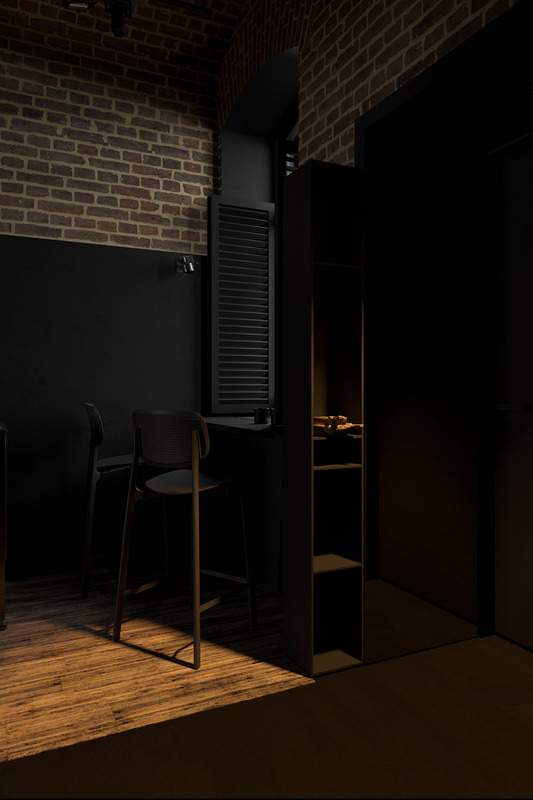 Three kitchen bar stools lined up at the central island have taupe seats to stand out against the black unit. 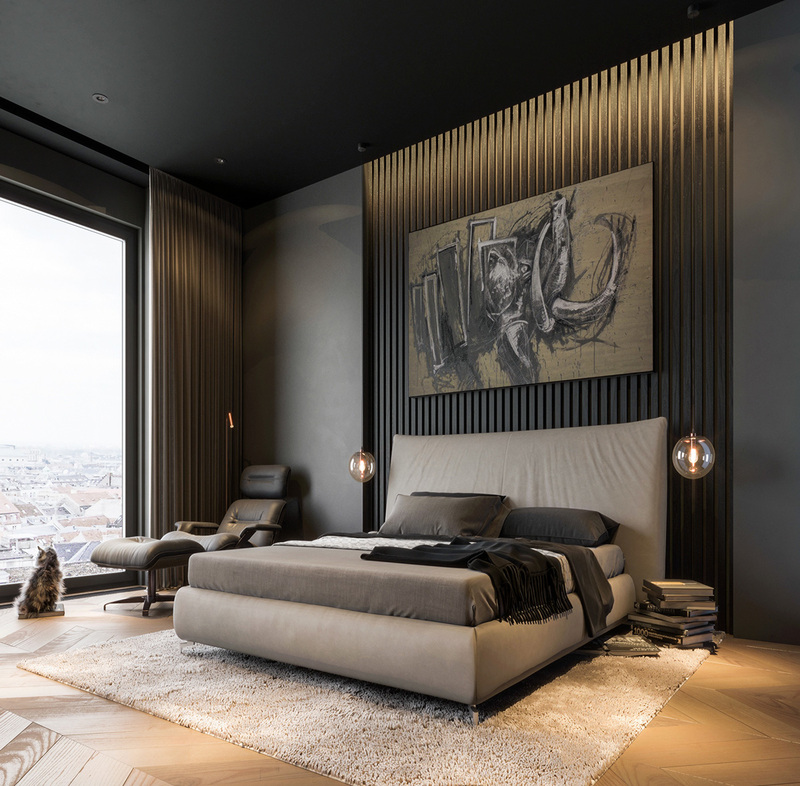 Black, grey and taupe bedroom decor is illuminated by two globe pendant lights, situated either side of a ridged headboard feature wall. A slender copper floor reading lamp lights a comfortable chair and footstool. 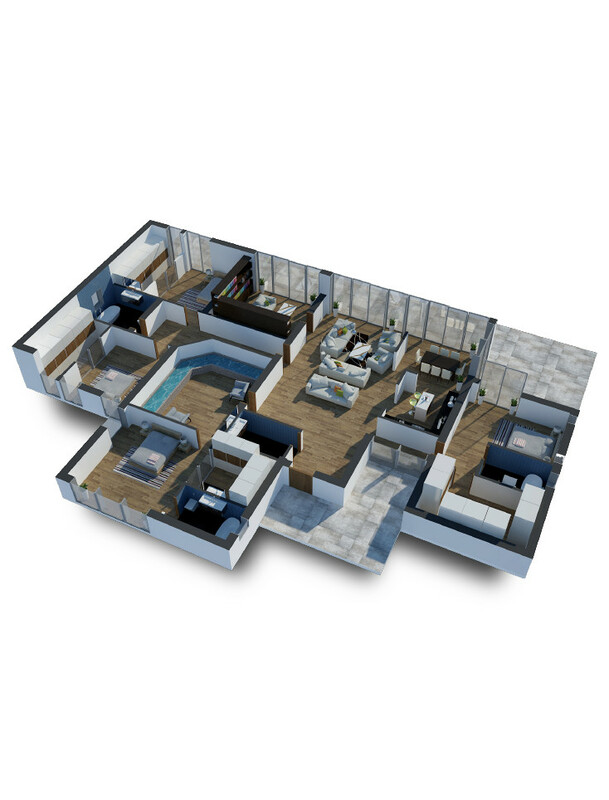 Our second featured dark home design has a wonderfully unique dual tone herringbone floor, which sweeps through a large open plan living area. 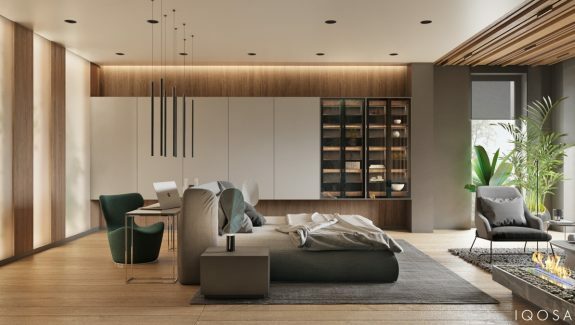 A solid area of white floor planks transition into rich dark wood tone by introducing contrasting planks at random intervals across the midsection to stunning effect. 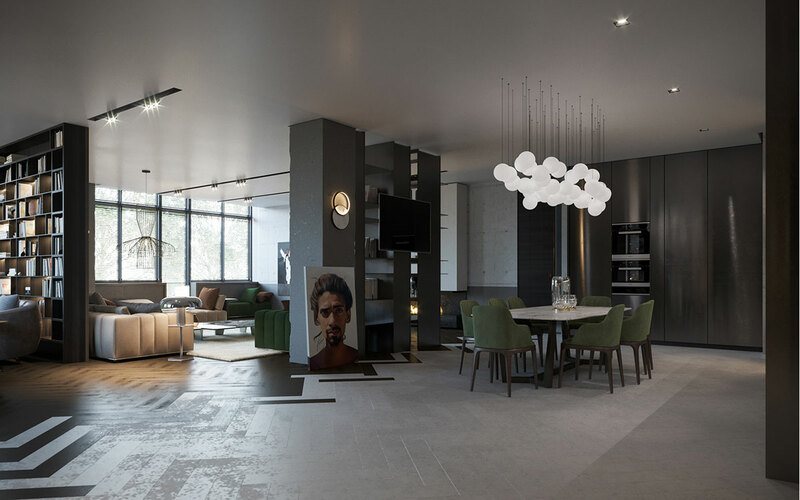 Floor lamps are a popular choice for soft lighting by a sofa; this seating area also incorporates a soft glowing suspended ceiling light, an artistic installation of wall lamps and gentle strip lighting within the shelves an adjacent bookcase. 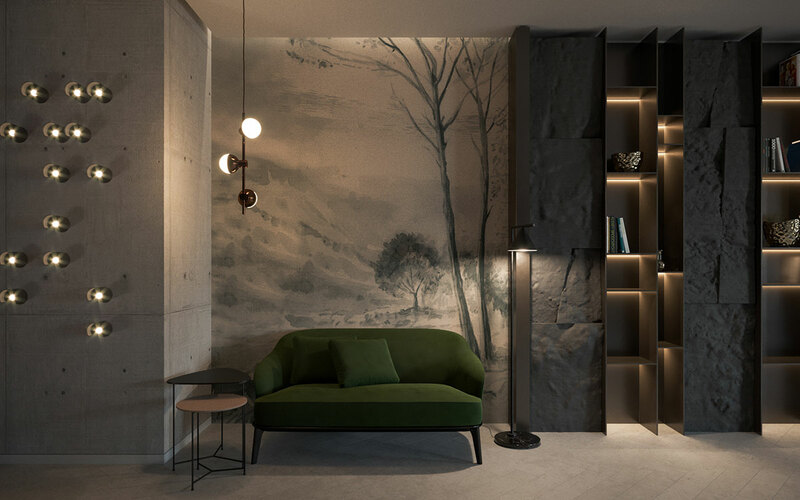 A landscape wall mural makes a dreamy vista. 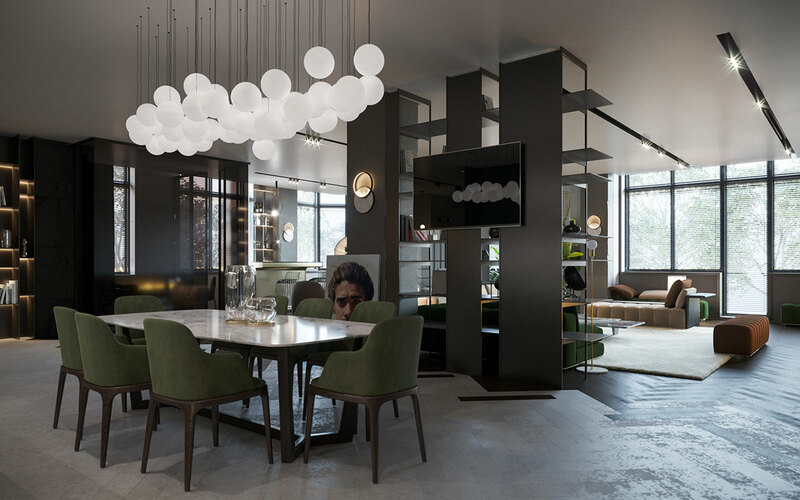 Dozens of orb shaped dining room pendant lights cluster, like giant white caviar, at the centre of a kitchen diner. 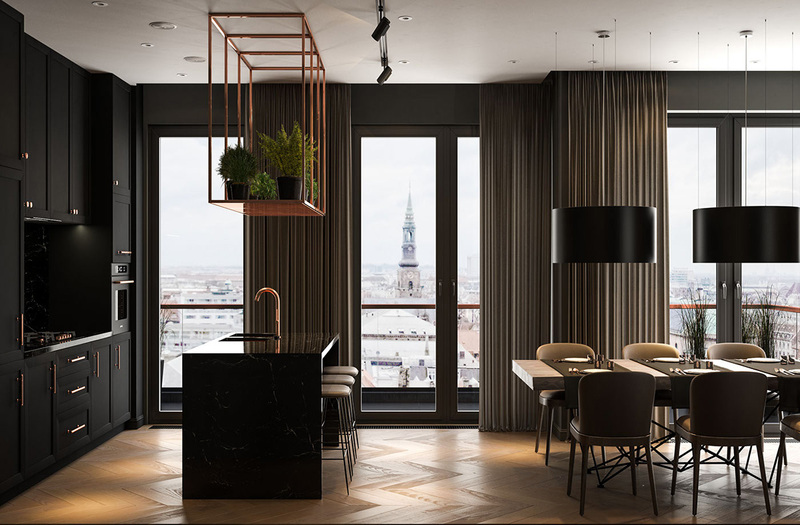 Black kitchen cabinets surround the eating area, cut through with a stripe of dazzling white marble. 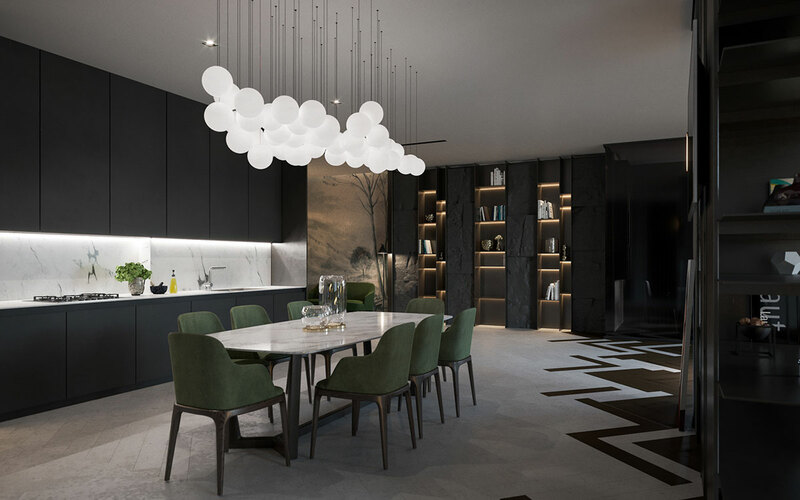 The cloud of dining pendants float over a white marble table top, teamed with deep green dining chairs. 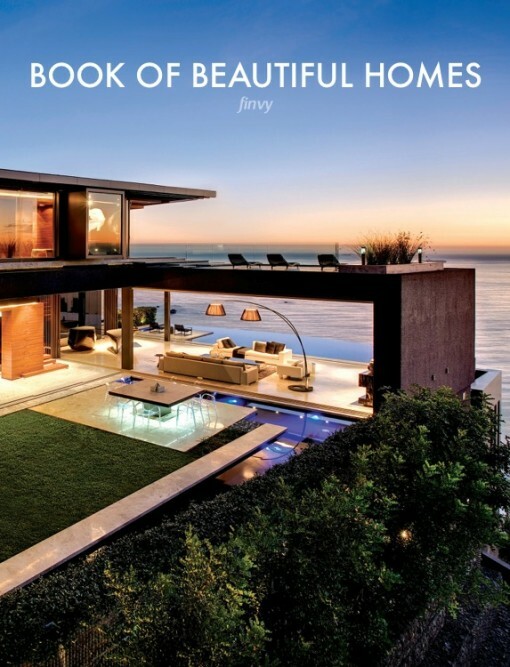 A blue bed injects some colour into the master suite. 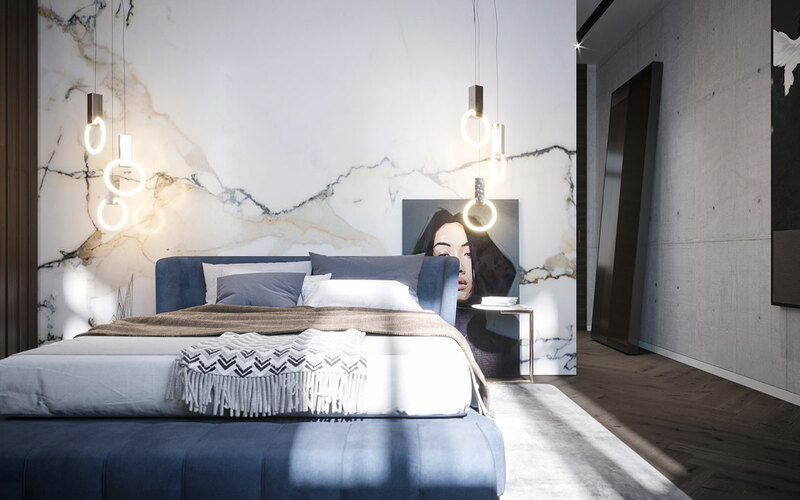 Suspended at either side of a marble headboard feature wall are hoop shaped bedroom pendants, which are the HALO design by Matthew McCormick, available for purchase here.. Artwork is propped behind a neat bedside table. A luxury closet is made up of glass cabinets with dark wood tone frames and shelving. 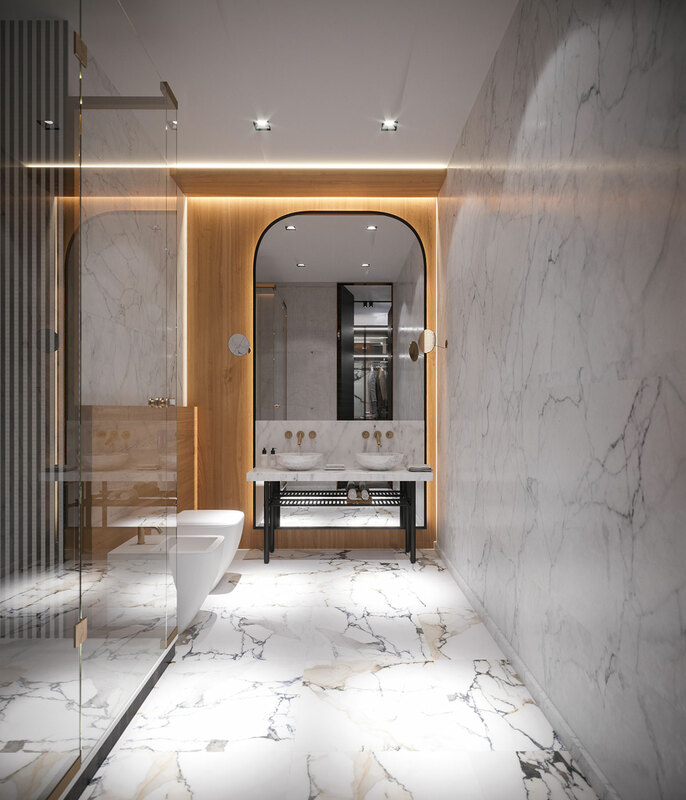 The bathroom holds a surprisingly light decor scheme, clad in white marble. A light woodtone panel, lit around its perimeter, creates a feature behind a double sink bathroom vanity unit. 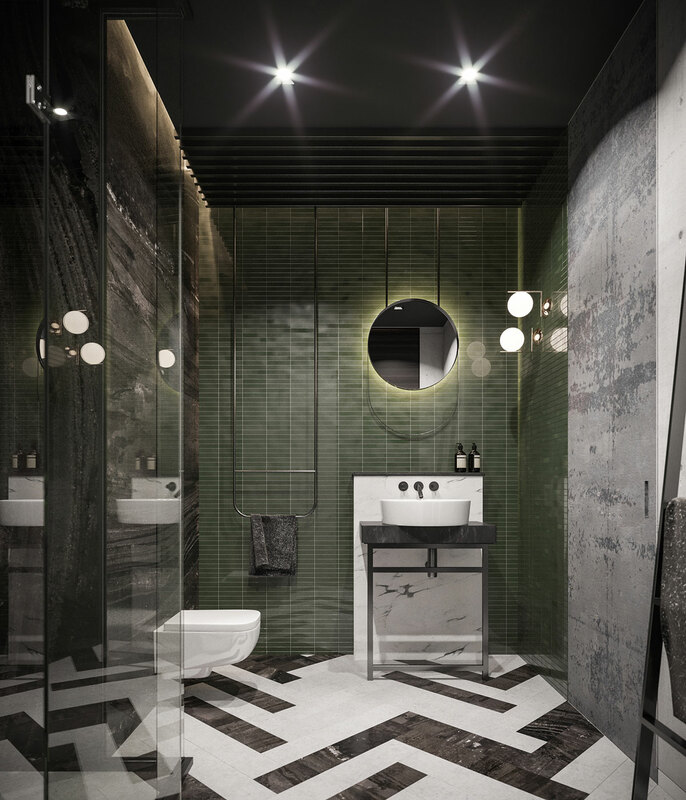 A second bathroom scheme goes back to the dark decor trend, with deep green wall tiles and a black ceiling. The floor sports a striking black and white herringbone pattern. Home number three is by far the darkest of the lot. 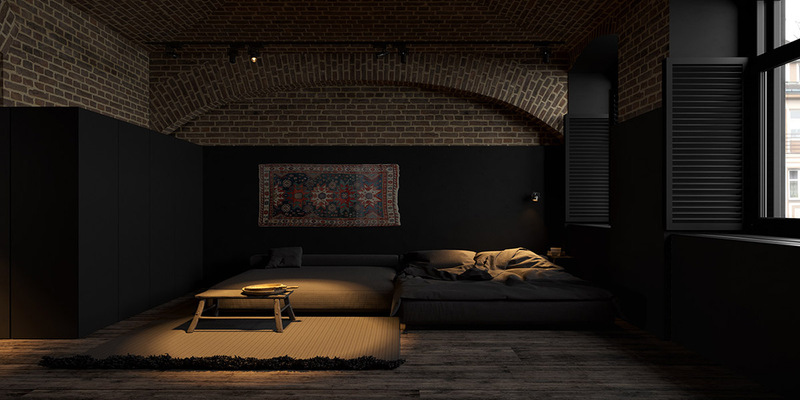 Architectural arches and exposed brickwork walls lift a shadowy black living room. 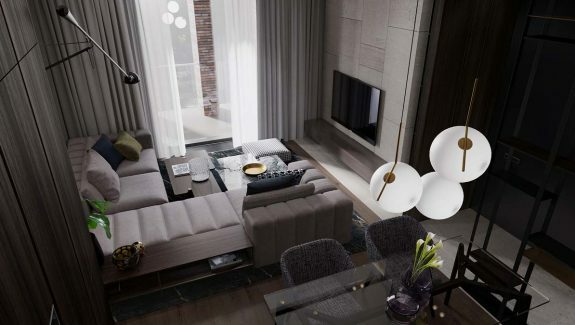 Lighting falls in spotlights over a modern sofa. 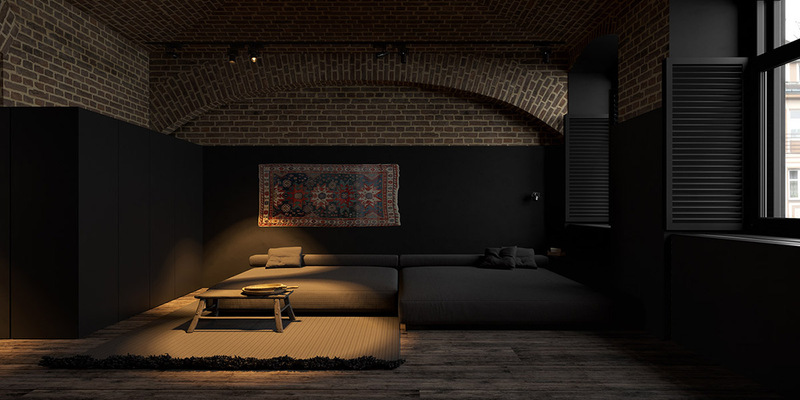 The sofa stretches out like a huge bed in the darkness. 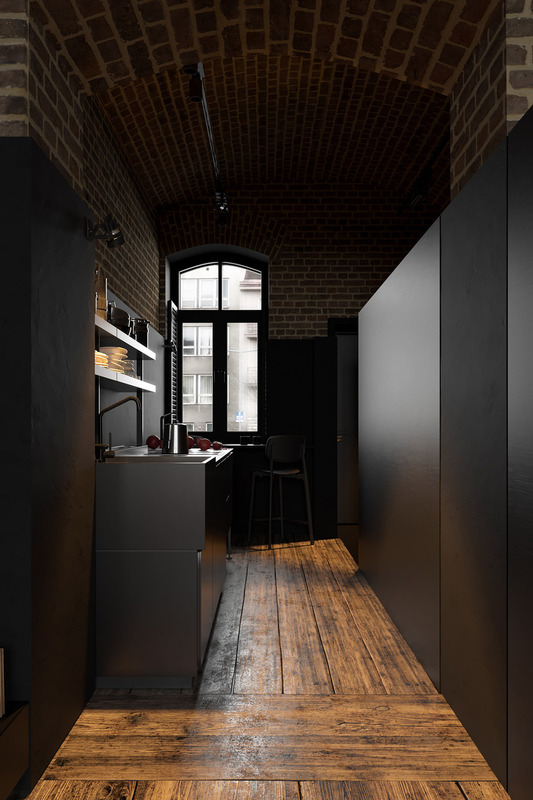 A compact kitchen runs straight off the brick wall living room, visible through an arched doorway. 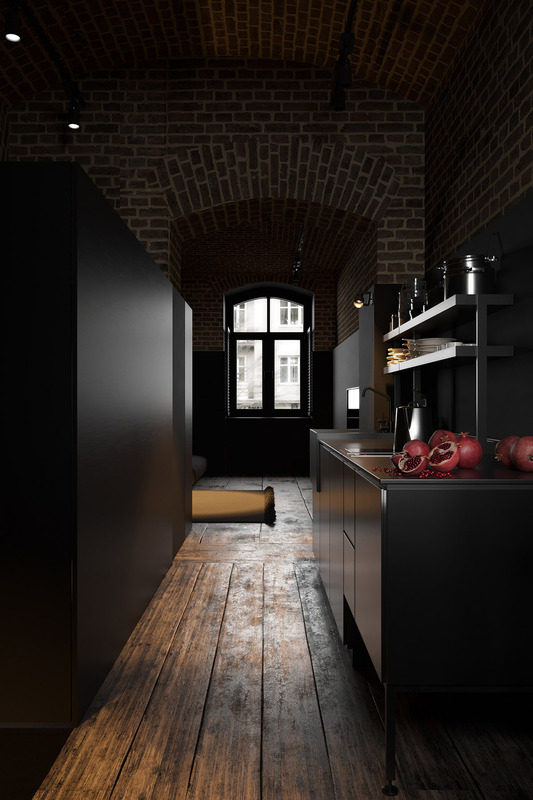 Black cabinets and panels flank the kitchen walls. Exposed kitchen shelving provides a place to display a collection of white crockery and gleaming stainless steel pots. 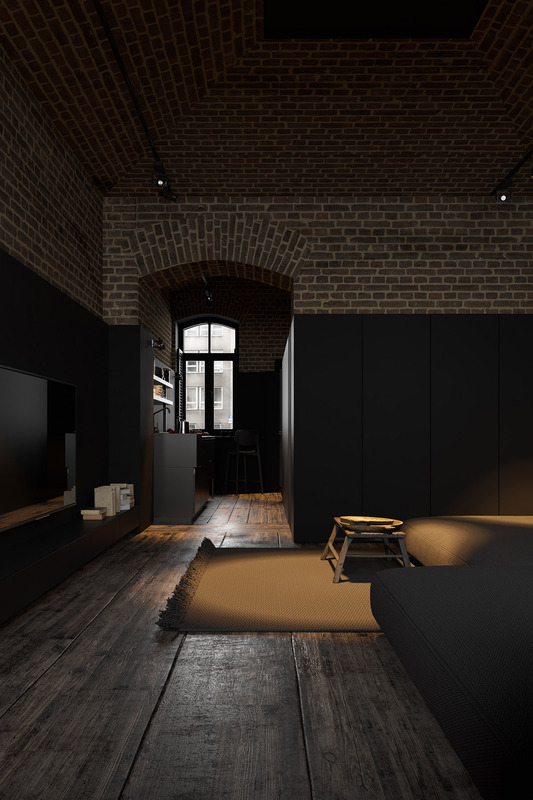 The shelf contents bring a small scattering of light to the all encompassing blackness of the room. An air of decadence transcends in the kitchen, where an abundance of pomegranates tumble – though It appears they’re missing a modern fruit bowl!. 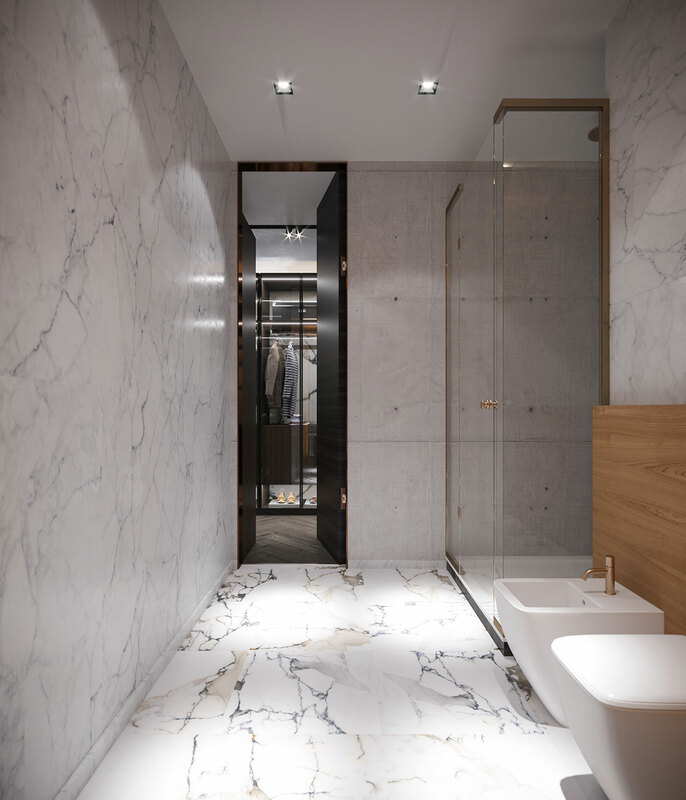 The shower is a simple black box, with a light wood floor. 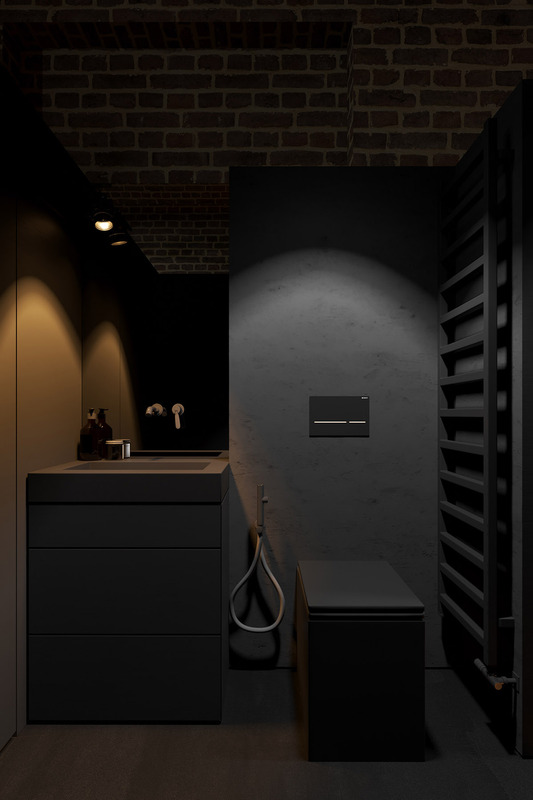 A square black toilet matches a black floorstanding vanity unit with matching basin. 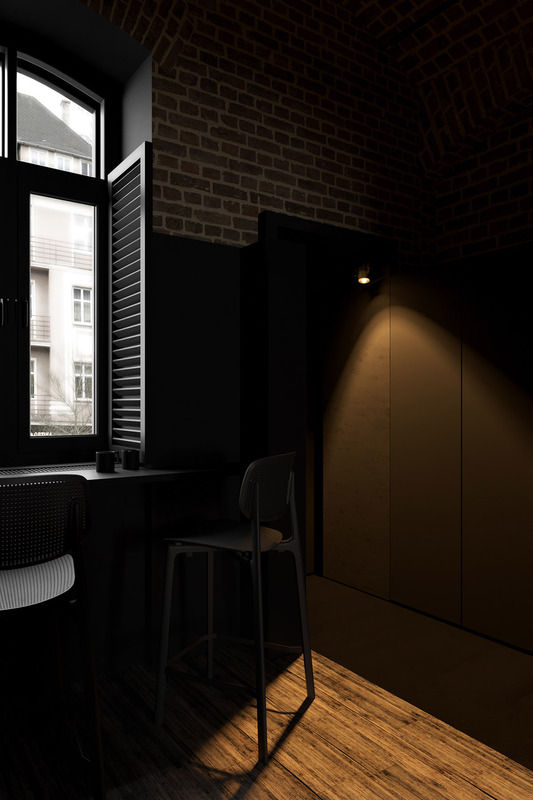 At the end of the small kitchen, a casual coffee area has been created by placing two black barstools by the windowsill. 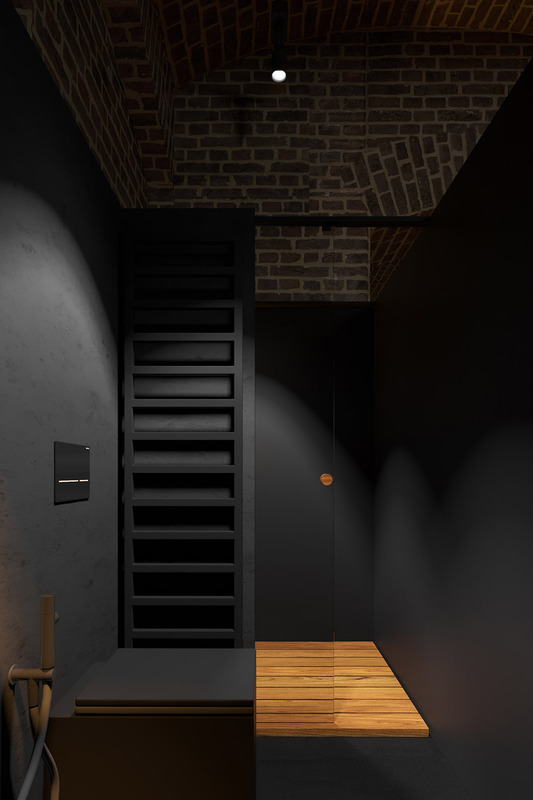 A black heated towel rail climbs the wall just outside of the shower cubicle. 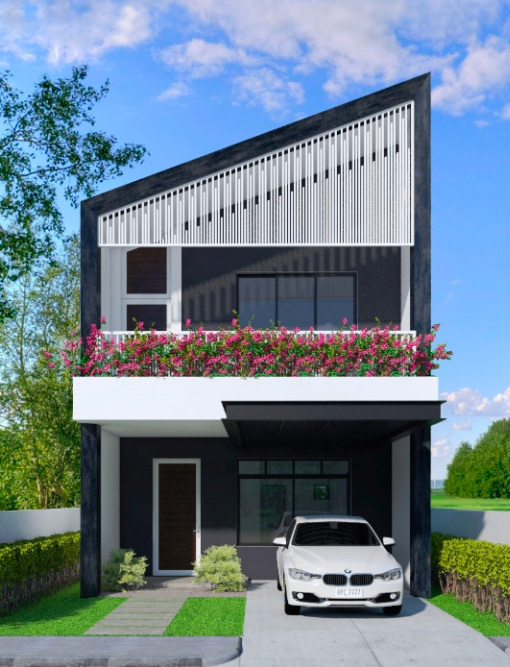 Black shutters dress the windows.